We have previews for you! Check out the first videos of "Re-Guitaring" ever, it's on our blog! We are back from NAMM 2019! It was an incredible show! 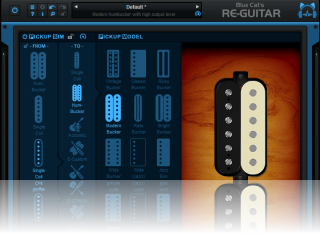 We were thrilled to get great feedback on the upcoming Re-Guitar plug-in and our latest updates on other plug-ins. We are happy to share with you our NAMM 2019 pictures. Check them out! We are happy to unveil today Blue Cat's Re-Guitar, a brand new guitar tone simulation plug-in that can completely transform the tone of your instrument: change the pickups, dig the body or emulate an acoustic guitar, in the box! The plug-in will be demoed at NAMM this week on booth #16300, and more details are already available on the Re-Guitar plug-in page. Re-Guitar is expected to be released around Q2 2019. It will be available as a built-in plug-in inside Axiom (delivered as a free update) or separately. At this occasion, Axiom is available with 25% off until January 31st. Enjoy! We are happy to announce significant (free) updates to Blue Cat's Dynamics, Protector, FreqAnalyst Multi, StereoScope Multi and DP Meter Pro, including refreshed Graphical User Interfaces and several new features, as explained here. These updates are expected to be released later this quarter and will be demoed this week at the NAMM Show on booth #16300. If you are a registered customer, you can already access to preview versions on the full version download page (link receied by email upon purchase). Enjoy! We are on our way to NAMM 2019! We are looking forward to seeing you on booth #16300 (ACC North Level 1), with a brand new guitar plug-in and several significant updates! Please follow us on our blog or facebook, twitter or instagram to get all the news in real time! We might be slower to respond to emails and forum posts this week. Don't worry! We will be back full time on February 1st! It's the end of the year, it's time to celebrate our 15 years in the audio software business and the arrival of 2019 (expecting many updates and new software...)! We have launched our year-end promotions, with up to 40% off! They will last until December 31st only, don't miss them! Just purchased a product from us? Don't worry: you will get an additional 10% discount on these promotions, like all existing customers prior to this announcement: check your email! We are happy to announce the update of all our free plug-ins! 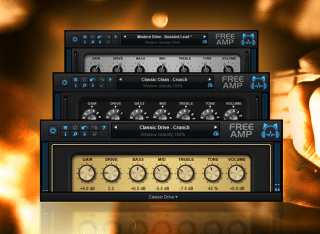 The Free Pack bundle that gathers them all now also includes the Free Amp plug-in. With refreshed zoomable user interfaces, performance improvements and a few fixes, this is a recommended update for all 7 plug-ins (see details on each product page). Of course, all these plug-ins are still 100% free: no registration, no dongle, no mailing list... Just download and install them freely. Enjoy! We are happy to announce the release of Blue Cat's Axiom 1.12, Destructor 1.41, Late Replies 1.31 and PatchWork 2.31. These new versions mainly bring performance improvements and a few bug fixes: audio analysis tasks (spectrum analyzer or guitar tuner) are now performed in the background, so that they do not impact audio performance anymore. These updates are free for existing customers (using the link received by email upon purchase). Enjoy! We are thrilled to finally unleash Blue Cat's Plug'n Script 3.1! This new version is now available as a standalone application, in addition to most common plug-ins formats. And it now lets you export your creations as independent VST, VST3 or Audio Unit plug-ins! Blue Cat's MB-7 Mixer 3.2 is here! With drag and drop support for plug-ins, performance improvements, an impulse response loader for the built-in EQ and several fixes, this is a recommended free update for registered customers! If you do not own the plug-in yet, don't miss our promotion: it's $99 or 99 EUR (instead of 129) until November 30th, check it out! Blue Cat's Late Replies 1.3, a new version of our creative delay plug-in is now officially available! This new release adds drag and drop support for plug-ins, impulse responses support for the built-in EQ plug-in and several performance improvements. This is a free update for registered customers, and if you do not own the plug-in yet, you can get it for $99 or 99 EUR (instead of 129) until November 30th, check it out! As usual, the update for registered customers can be downloaded from the same location as the original full version (link received by email upon purchase). Blue Cat's PatchWork 2.3 is now available! With drag and drop support, several performance improvements and impulse responses support in the built-in EQ pug-in, this free update will definitely improve your workflow, check it out! As usual, the update for V2 users can be downloaded from the same location as the original full version (link received by email upon purchase). If you are still on version 1, an upgrade link is available from the same page. We have just issued a maintenance update for Blue Cat's Axiom: it fixes several issues with built-in delays (see product history for details). It is recommended to update if you have installed version 1.1 of the plug-in or standalone application. October will be the "Guitar Month" on bluecataudio.com! We are happy to announce the release of Blue Cat's Axiom 1.1, Destructor 1.4 and Free Amp 1.1. These new versions now support drag and drop for an optimal workflow, and they can now load and manipulate impulse reponses (IR). At this occasion, we are launching promotions on guitar software (up to 25% off), available until the end of the month. Don't miss them! Updates are free for existing customers (using the link received by email upon purchase). Also, check out our new video tutorials for Axiom and the free guitar presets for Axiom, Destructor and Free Amp! Have you migrated to the new MacOS "Mojave" yet? Check out our Mojave compatibility test report before you do! Back to school? It's time to practice your instrument: we have just launched a guitar contest with prizes worth $1799, and we would like to hear you play! Just grab one of our guitar amp simulation plug-ins and record a video of yourself playing along Martin Miller's backing track provided by jtcguitar.com to enter the competition. Check our guitar contest page for details and exact contest rules! This new version includes 4 new built-in audio effects (reverb, harmonizer, wah, mute), many new presets and major performance improvements: this is a recommended free update for everyone, check it out! As usual, the update for V2 users can be downloaded from the same location as the original full version (link received by eail upon purchase). If you are still on version 1, an upgrade link is available from the same page. We are very happy to announce the release of Blue Cat's Free Amp, a brand new amp simulation plug-in that is entirely free! 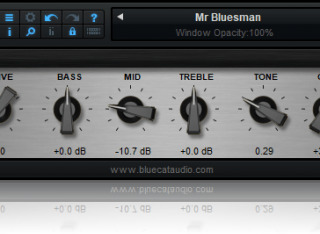 Using the Destructor dynamic distortion engine, Blue Cat's Free Amp offers three amp models for a wide range of guitar tones. You can also download 20 additional free presets by Hans Van Even for the plug-in. Check it out, it's a simple free download: no registration required, no limitation and no dongle, it's a Free Amp! 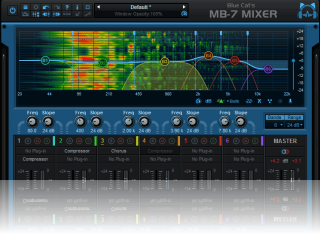 Blue Cat's MB-7 Mixer 3.1 has been released! This new version includes 28 built-in audio effects that can be applied to individual frequency bands, and dozens of new features and enhancements improving the workflow and performance: this is a recommended free update for everyone, check it out! Blue Cat's Late Replies 1.2, a new version of our creative delay and multi effects plug-in is now available! This free update adds new built-in effect plug-ins borrowed from the new Axiom, and many new presets. Check out the full change list for more details. The update is available from the same location as the original full version (link received by email upon purchase). If you do not own the plug-in yet, check out the demo! Blue Cat's Destructor has just been updated! This free update includes the new randomize feature and all the new factory presets that were created for the release of Axiom. As usual the update can be downloaded from the same location as the original full version (link received by email upon purchase). If you do not own Blue Cat's Destructor yet, check out the demo! 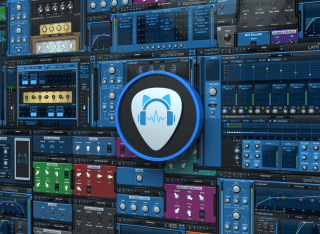 Blue Cat's Axiom 1.0, the new generation of multi effects processors and amp simulation software for guitar and bass is now available, within the new Axe Pack bundle or separately! With its powerful dual amp simulation based on Blue Cat's Destructor, its 40 built-in effects and the ability to load third party plug-ins, Axiom will bring your axe beyond the limits, check it out! Special introduction offers are available for both Axiom and the Axe Pack bundle until May 19th, and upgrade paths are available for existing customers during the same period. Don't miss it, check out the demo! Blue Cat's Late Replies, our creative delay and multi effects plug-in has just been updated! This new version brings many Graphical User Interface enhancements (including GUI zoom), new presets management features, major performance improvements and fixes a couple of issues. Check out the full change list: it is a recommended (free) update, available from the same location as the original full version (link received by email upon purchase)! If you do not already own the plug-in, it is available for purchase at 99 EUR/USD instead of 129 until April 20th, check it out! 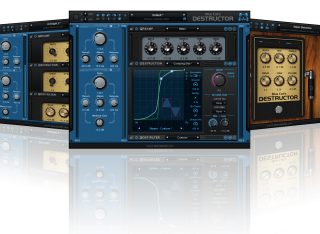 We are happy to unleash Destructor 1.3, a free update for our distortion and amp simulation plug-in. With a new "minimized" amp-style view, multiple performance enhancements, new clean guitar amp presets (and many other improvements), this is a recommended update! NAMM 2018 is now over... 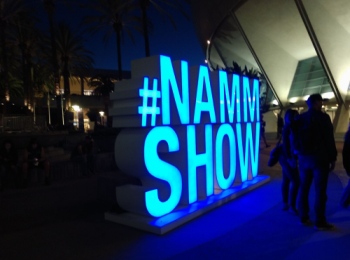 Check out what we have announced and demoed at NAMM this year! A new product for your guitar and bass tones, major products updates and free previews already available for existing customers... There's a lot to be released later this year! Also we have extended the 20% discount offer on Blue Cat's Destructor and Late Replies until we are back from NAMM. That's two more days to take advantage of this very special offer, don't miss it! 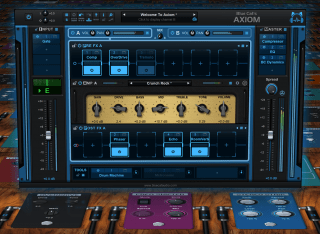 Blue Cat's Axiom is our new multi effects processor and amp simulation software for guitar and bass. We are very excited to unveil this new software at the NAMM Show this week, on booth #16300. You can already read more details about Blue Cat's Axiom on our blog. At this occasion we offer 20% discount on Blue Cat's Destructor and Late Replies until the end of the show. It's the end of the year, it's time to celebrate the arrival of 2018: We have launched our year-end promotions, with up to 40% off! They will last until January 10th only, don't miss them! Just purchased a product from us? Don't get mad: you will get an additional 10% discount on these promotions, like all existing customers prior to this announcement: check your email! Ladies and gentlemen, please welcome Blue Cat's Destructor 1.2! This free update mainly adds GUI zoom (up to 2x), retina displays support, and a new installer for Mac. Presets management has also been improved, and a few minor issues have been fixed (full change log on the Destructor plug-in page). Also, new legendary guitar tones presets crafted by Hans Van Even are now available for download for free. You can check the presets in action in our legendary guitar tone videos. As usual, the update is free for existing customers, and new customers can purchase the plug-in with 10% off until December 5th. Enjoy! Blue Cat's PatchWork 2.1 is here! Our virtual patchbay for plug-ins has now become a powerful multi effects processor on its own: it now includes 25 built-in audio effects (borrowed from Late Replies), 75 new effect presets and a fully zoomable user interface (GUI). An overview of the new features is available on our blog. As usual the update is free for existing PatchWork V2 owners and can be downloaded from the same location as the original full version (link received by email upon purchase). 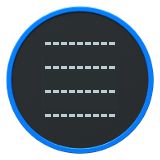 Blue Cat's Plug'n Script 3 has just been updated to fix a problem with exported VSTs for Mac that were not properly detected by host applications. Please download the latest version (3.01) if you intend to export VST plug-ins for Mac. We are happy to finally unveil today Blue Cat's Plug'n Script 3.0, a new version of our audio & MIDI scripting plug-in. The user interface has been completely overhauled, with a new workflow and the ability to export your creations as independent VST plug-ins. The plug-in is available for purchase with 20% off until November 5th, while existing customers get an extra 10% discount (check your email!) during the same period. Upgrade is free for customers who purchased the plug-in since last update, and previous customers will receive an upgrade offer (for a small fee) by email. 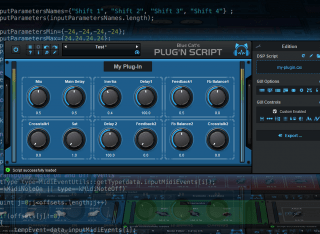 More details about the plug-in and demo downloads can be found on the Plug'n Script scripting plug-in page. New features are also covered on our blog. Check it out! Ready to migrate to MacOS High Sierra, Apple's new operating system released this week? Blue Cat Audio plug-ins should run fine on this new system, with just minor limitations and changes. Check out our plug-ins compatibility test results for more information. With the recent addition of Blue Cat's Late Replies to our guitar plug-ins collection, you now have access to an incredible number of guitar tones and effects, with just a few of our plug-ins. Wondering how? Check out these new guitar demo videos demonstrating our new creative delay plug-in combined with Blue Cat's Destructor tone builder inside PatchWork! We are happy to unleash today Blue Cat's Late Replies, a new creative delay and multi effects plug-in, capable of hosting third party plug-ins anywhere in the signal path - even in the feedback loops. The plug-in is available for purchase with 25% off until September 17th, while existing customers get an extra 15% discount (check your email!) during the same period. More details about the plug-in, video examples and demo downloads can be found on the Late Replies creative delay plug-in page, check it out! Heads Up! You can now follow Blue Cat Audio on Instagram! We will be using this new account to let you know what is going on behind the scenes: it's a new window to the dark side of the cat! It is also the opportunity for you to connect with us with the #bluecataudio hashtag. See you soon on Instagram! 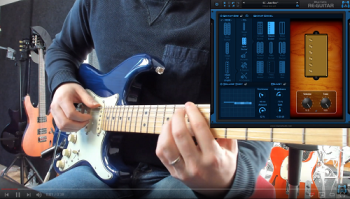 We have teamed up with Eli Krantzberg to offer you free tutorials about Blue Cat's Destructor in the studio: in these videos, Eli shows you how he uses Destructor to both record and mix guitar parts for a TV underscore cue he is working on. Guitarist connected straight into the box, the series relates the chase for the perfect guitar tone, from clean rhythm settings to screaming leads. As you will see, it is as simple as picking up a few presets and tweaking them to your taste. Blue Cat's PatchWork 2.0 and MB-7 Mixer 3.0, announced last month at NAMM, are now available! With brand new user interface designs, dozens of new features, improved third party plug-ins support and audio routing, these new versions aim at redefining the user experience and streamlining the workflow. Both plug-ins are now available for purchase with a special introduction price until March 15th (15% and 10% off). For existing customers, upgrade paths are available. Free update and upgrade offers have been sent by email. What's better than a good trade show to start 2017? If you are in the L.A. area next week, please stop by our booth (#6242) at the NAMM show in Hall A to discover our new software before anyone else! Yes, we have many surprises to show you... But if you cannot make it, don't worry, we'll post news on social medias during the show. Keep connected! Merry Xmas! We found the time to update 3 of our best selling plug-ins before the new year! These new versions mainly bring a couple of bug fixes and minor improvements that will make your audio life easier. Check out Blue Cat's Destructor 1.11, Blue Cat's MB-7 Mixer 2.54 and PatchWork 1.74! If you already own these plug-ins, you can get the latest version from the same location as the original download (link received by email upon purchase or registration). If you don't, don't miss our year-end promotions, with up to 25% off! Blue Cat's Destructor 1.1 is now available, with several user interface and worklow enhancements, including more than 200 new visual styles. Check it out! We have also launched our year-end promotions, with up to 25% off! They will last until January 5th only, don't miss them! 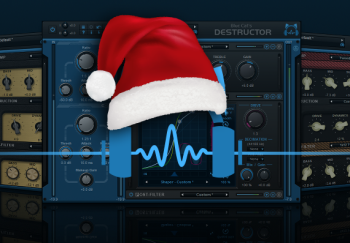 Blue Cat's Destructor, our new distortion and amp sim modeling plug-in has just been updated! V1.01 mainly brings improvements to the demo version (removing some limitations) and fixes a few issues found in the initial release. The update is free for existing customers and can be found at the same location as the initial full version (link received by email upon purchase). Full change list is available on the Destructor plug-in page. Enjoy! Launched earlier this week, Blue Cat's Destructor has already been reviewed a couple of times: Pro Tools Expert, Studio One Expert, and Audiofanzine.fr all truely enjoyed the plug-in! These reviews, as well as video demos of our distortion plug-in are available on the blog! Also on the blog this week, Q&A sessions about the inception of the plug-in, and how it can be used for electronic music. Enjoy! We have partnered with Groove3 to offer you free 30 days access to 1200 hours of video tutorials, with an awesome in-depth training for Blue Cat's Destructor that covers all the features of the plug-ins in details. The offer for the free pass expires on October 24th, so don't miss it! We are happy to finally unleash today Blue Cat's Destructor, our tone shaping channel strip and distortion modeling plug-in, capable of simulating many types of distortion, as well as more subtle and clean tones. The plug-in is now available for purchase with 20% off until 11/11, while existing customers get an extra 10% discount (check your email!) during the same period. More details about the plug-in and demo downloads can be found on the Destructor plug-in page. You may also want to check out this first guitar-centric review of the plug-in. 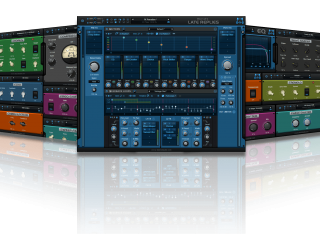 But don't get it wrong: this plug-ins has a wide range of applications besides guitar and bass amp simulation. We are happy to introduce today Blue Cat's Destructor, our new distortion and amp sim modeling plug-in, capable of simulating many types of distortion - and it works for subtle and clean tones too! The plug-in is currently being demonstrated at the AES Convention in Los Angeles (check it out on booth #410) and will be available for purchase on October 11th. 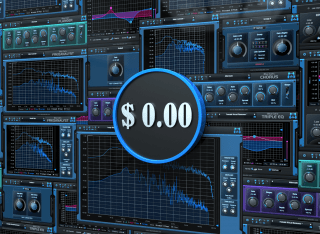 Wether you are a guitarist, bassist, into electronic music, or mixing and mastering, this plug-in was designed for you! If you cannot be at the AES, read more information about Blue Cat's Destructor and listen to the plug-in on the product page or on our blog. This is also the opportunity for us to introduce a new guitar software category, listing our most useful tools for guitar and bass. After several months of hard work behind the scenes, We are happy to unleash our new logo and announce the launch of a brand new plug-in, which will be revealed at the 141st AES Convention in Los Angeles, in exactly 10 days. If you want to see this mystery plug-in in action, please stop by our booth (#410) at the AES! More information will be posted soon on our blog and social media. So keep connected! 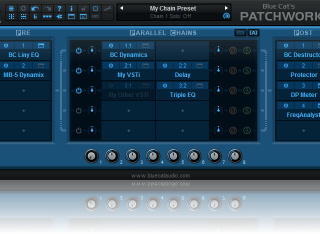 We are happy to release new versions of Blue Cat's PatchWork and MB-7 Mixer that include VST3 plug-ins hosting. You can now load Blue Cat Audio or third party VST3 plug-ins into both plug-ins, mixing them with VSTs and Audio Units in the same session. More details about this new release are available on our blog. The update is free for existing cutsomers and can be downloaded from the same link as the original full version (link received upon purchase). We are happy to release today a massive update for 16 of our plug-ins: Blue Cat's Plug'n Script, Dynamics, PatchWork, FreqAnalyst Multi, MB-7 Mixer, Protector, StereoScope Multi, Liny EQ, DP Meter Pro, Oscilloscope Multi, and our 6 free plug-ins are now available in VST3 format. So, what's new here? Don't miss our blog post explaining the benefits of VST3. Also, this update includes additional improvements for all plug-in formats regarding presets and skins management, and compatibility enhancements for plug-in hosting. So it is recommended for all customers! By the way, this update is free and can be downloaded from the same location as the original full version, using the link received upon purchase. Of course, free plug-ins remain fully free! We are pleased to announce the upcoming release of VST3 versions of most our plug-ins. These new versions will be available as part of a free update in February. Please come and see the demos at the NAMM Show, booth #6331. If you cannot make it to the NAMM, a preview is already publicly available for Blue Cat's Free Pack, check it out! Also, Existing customers of Blue Cat's Dynamics, , MB-7 Mixer and Plug'n Script can download a VST3 preview of their plug-in using the "next release preview" link at the bottom of the full version download page (link received by email upon purchase). Please try them out and tell us what you think! It's time for Winter NAMM! If you plan to visit the NAMM show this year, please stop by our booth (#6331 in Hall A)! We'll be happy to show you our latest demos... and there are surprises too! Looking for older news? Please consult the 2015 News page.